Previously we learned the basic formula of the current divider principle, its equations, and theory. In this article 20 solved examples of provided which let you master the current divider rule. Two parallel resistors having their values 50 ohms and 100 ohms are connected in parallel. Find the current flowing through each when the connected source is of 20 A. Example 2: Repeat the above for R1 = 300 Ω, and R2 = 500 Ω and input 50 A. Example 3: Repeat Ex 1 for R1 = 20 Ω, and R2 = 1000 Ω with input 100 A. Comment the observations. Answer: 98.04 A and 1.96 A. 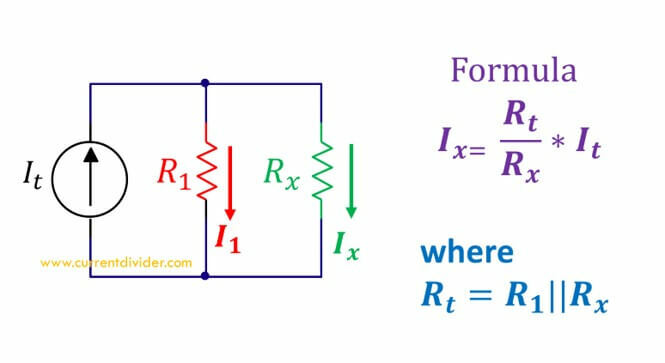 From this we observe that a very small resistor in parallel with a very large resistor has almost all the current divided across it. In general, the smaller the resistor the more current drop will have it. Example 4: Repeat the Ex 1 for R1 = 5 kΩ and R2 = 20 kΩ with 200 A input. Answer: 160 A and 40 A. Example 5: Repeat Ex 1 for 1 kΩ and 5 kΩ when the input is 20 mA. Answer: 0.0166 A and 0.0033 A. 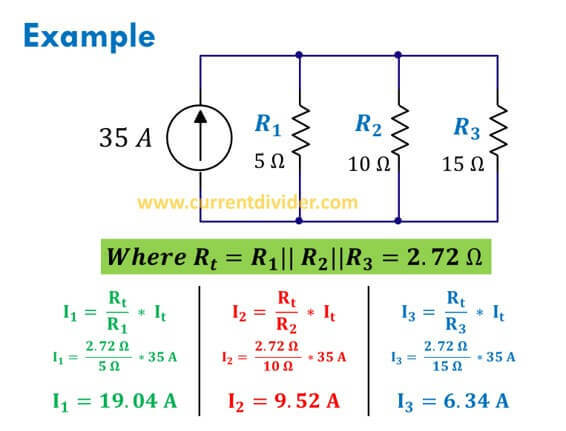 Example 7: Repeat the above when the source is 50 A and resistors are 2, 4, and 6 ohms. Answer: 27.25 A, 13.62, and 9.08 A. Example 8: Repeat the above for 100 A source with 10, 15, and 20 ohms. Answer: 46.15, 30.76, and 23.07 A. Example 9: Repeat the example 6 for 20 A source when resistors are 100, 1000, and 10,000 ohms each. Answer: 18.01, 1.80, and 0.180 A. 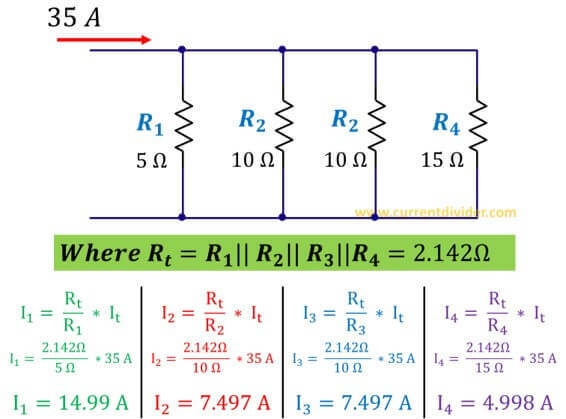 Statement: Four parallel resistors of 5, 10, 10, and 15 ohms are connected in parallel. 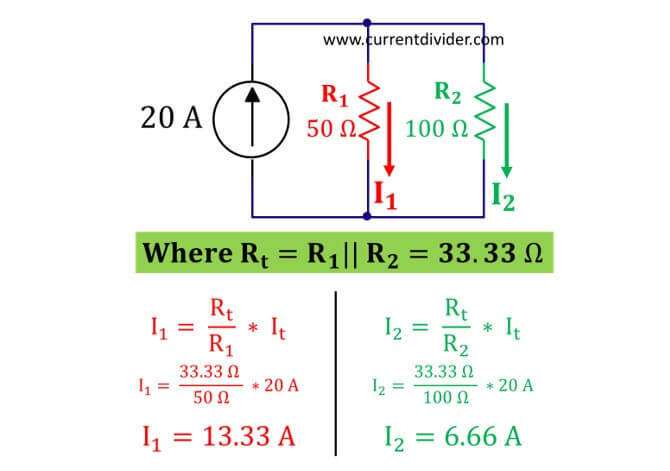 If 35 A current enters the node, find the current divided across all resistors.